Claude Monet’s series of paintings Water Lilies first captured my attention at the Musée de l’Orangerie in Paris five years ago. I had seen copies of some of them online and in books, but seeing them in large oval rooms, in the original form they had been created, cast a strange sort of enchanting spell. It left me with the feeling of reading a book where the writer had decided to leave the fate of all his characters to his reader’s imagination. As I saw the paintings from different angles in the room, I wondered where Monet had found the water lilies, and what power they had possessed for him to spend over 30 years of his life painting a series of about 250 works. The answers, at least to some of my questions, lay in the town of Giverny in the French countryside, 75km from Paris. Curious after seeing Monet’s paintings, my family and I drove there one weekend to visit the artist’s house and garden. As soon as we drove in through the gates of Monet’s 2-acre garden and house, we were surrounded by a burst of colour. It was a hot summer’s day, and all the flowers in Monet’s garden—poppies, hibiscus, hydrangea, roses and lilies—were in full bloom. The visitors walking through the garden too were in their brightest clothes. Monet’s house had a pink façade, the dining room had yellow walls and the kitchen, blue walls. As we took in its riotous colours, my father and I joked about how every photo we took, however carelessly, would look perfect, for the objects themselves were so beautiful. We gazed at the bright flowers and experienced small thrills—like finding a yellow butterfly trying to hide among bright red poppies, or catching a glimpse of a large koi—red, gold, black fish swimming in the pond. Monet himself dug this pond, filling it with the waters of the Epte, a tributary of the Seine flowing through the property. Monet first saw Giverny from the window of a train while travelling from Vernon to Gasny. He had been living in Poissy in north France, looking for a change of residence after the premature death of his first wife and the beginning of a relationship with Alice Hoschedé, the estranged wife of his art collector friend, Ernest Hoschedé. He liked what he saw from the train window so much that he moved to Giverny in 1883 with Alice and their eight children, two from his first marriage and six from hers. By 1890, Paul Durand-Ruel, an art dealer, had managed to sell Monet’s paintings in the US. The money from these sales allowed Monet to buy the house he had been renting till then. He redesigned the already existing garden into something that led him to produce around 250 paintings. On exploring his house further, my family and I found the work of famous Japanese ukiyo-e artists like Utagawa Hiroshige displayed in the rooms. Monet had collected more than 230 ukiyo-e paintings over a lifetime. His obsession for these paintings began at the age of 16, with the purchase of his first Japanese print from a shop in Le Havre, in north-western France. Ukiyo-e translates to pictures of the floating world. These are paintings of pleasurable things and experiences, painted in Japan between the 17th and 20th centuries—often featuring geishas, theatre and nature. Monet is said to have used these floating pictures as inspiration while designing his garden. Researchers claim the famous landmark in the garden, Le Pont Japonais or the Japanese bridge, was inspired by Hiroshige’s print Inside Kameido Tenjin Shrine. It was hard not to see the whole garden as one gigantic painting, one that Monet himself referred to as his “greatest masterpiece”. Much like the fleeting beauty of an ukiyo-e, the raison d’être for the garden and water-lily pond seemed to be to provide pleasure and nothing else. Monet had crafted every part of the space almost as though he could foresee what he wanted to paint. I found myself wondering how the flowers would look in autumn, when the leaves would have fallen all over the garden and the plants would have started withering; in winter, when the flowers would have shrivelled; and in spring, when colour and life would have started to return. As the water lilies changed, catching the sunlight at different angles, evolving with the seasons, Monet’s depiction of them changed too. Towards the end of his life, Monet had cataract in both eyes. He continued to paint in his garden in Giverny, his water lilies becoming redder and more shapeless as his disease progressed. He died of lung cancer at the age of 86 in Giverny. 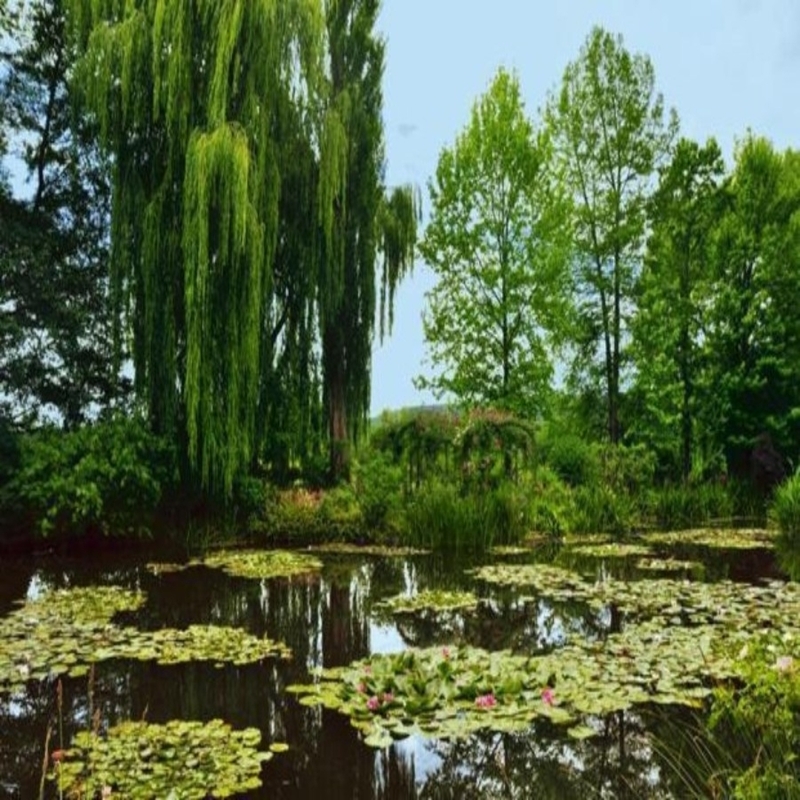 As we finished strolling around the garden and drove out of Giverny that afternoon, I felt a longing to return again, at another time, in another season, just to see how the water lilies had changed.